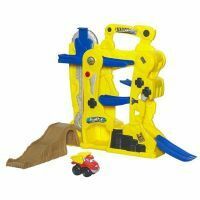 Tower playset features a tumbling track and a lift for your CHUCK THE DUMP TRUCK vehicle! Help your dump truck pal perform the flipping ramp stunt! Playset folds up easily and stores the vehicle for on-the-go fun. Playset comes with 1 vehicle and instructions. Includes 2 AA batteries. Ages 18 months and up. Rev up your engine for tons of tumbling fun! Set your CHUCK THE DUMP TRUCK vehicle at the top of this tower to watch him tumble down the moving ramp and come speeding out the side. Then, put him on the lift to send him up to the top to do it all over again! When you and your vehicle pal really want to put your driving skills to the test, send him down the ramp to do his flipping ramp stunt. When playtimes over, park your CHUCK THE DUMP TRUCK vehicle inside the playset and fold it up, so youre all set for on-the-go stunt fun!